How do I keep the water pipes in my home from freezing? I live in a cold weather area. At times, a water pipe in my house will freeze and in the past even had some pipes burst. It can happen either with a Hot or Cold water pipe. Some of the water pipes are running along the walls and towards the outside of my home and some of the pipes are in crawlspaces. What is the easiest way to make sure pipes don’t freeze during the winter? When the weather is below freezing the water in the pipes expand when it freezes. As the frozen water is expanding it adds pressure on the pipes and can cause them to break, burst, crack, or swell. This causes problems as water will not flow through the pipes and the pipes may crack or burst and can cause your home to flood. Freezing pipes can happen when the temperature remains around 20 degrees F. Pipes exposed to cold air are more likely to freeze at these temperatures. The easiest way to prevent this is to wrap all of the pipes with heavy pipe insulation. Stop Freezing Pipes 1 – Use a simple but effective product called “Tube Pipe Insulation”. This tube insulation keeps the water pipes “insulated” which protects them from the freezing temperature from reaching into the water pipe and freezing it. Insulating your water pipes slows the heat from leaving the water in the pipes and freezing is more unlikely to occur. Any type of insulation for water pipes will work to help them from freezing. 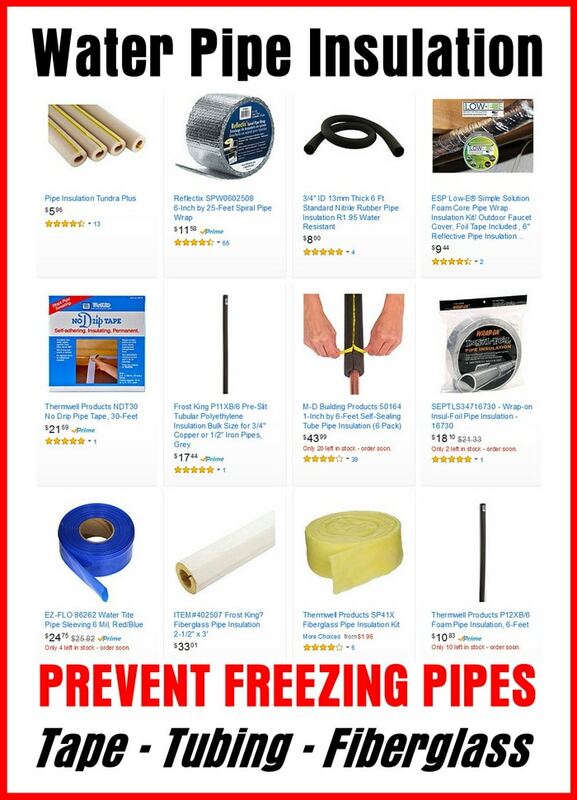 Just be sure to get the best recommended pipe insulation depending on the degree of cold temperature you live in. The colder the area, the thicker higher quality water pipe insulation wrap or tubing you should use. Stop Freezing Pipes 2 – Keep the cold temperature away by “insulating the space the water pipes run through”. The area where the pipes are located should be insulated. Insulate cold “open” areas where the temperature can be freezing therefore helping to prevent the pipes from freezing. Insulating the pipes and the open areas is the best way to protect the pipes from freezing. Stop Freezing Pipes 3 – Slightly open up a faucet at the farthest part of the plumbing. 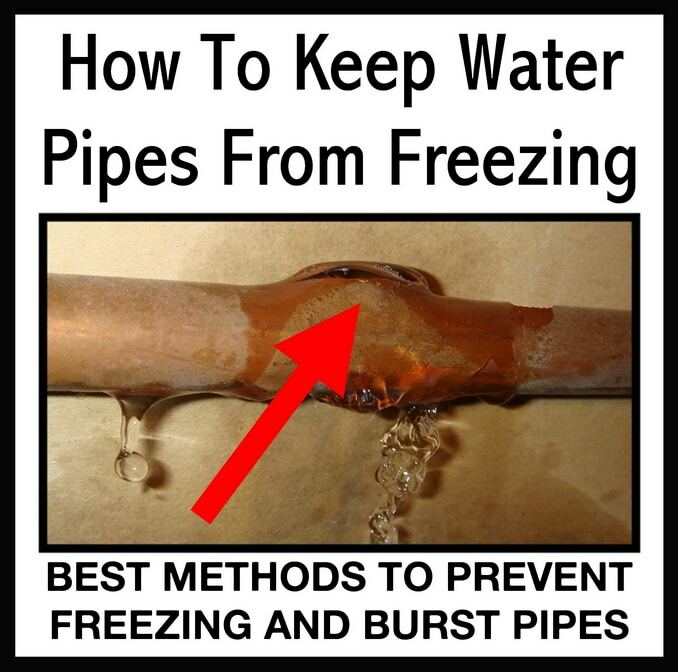 If you can keep the water flowing it will do a great deal to prevent the pipes from freezing. This works as it constantly introduces relatively warmer water into the pipes and this prevents them from cooling to below the frost or freezing point. NOTE: This is usually needed to be done if you are not living in the home during cold weather as water is not being used if no one is occupying the home. Stop Freezing Pipes 4 – Consider installing other types of insulation depending on the actual temperature or if you own a second home and the home is not occupied. Meaning no one is using water and no water if flowing through the pipes. Research specific products that are made to insulate water pipes. 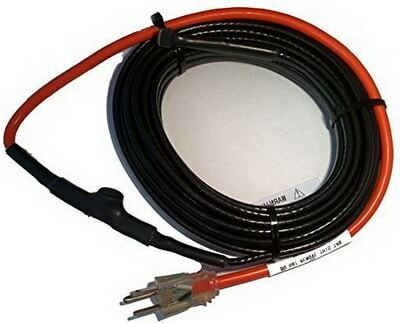 Insulating products that will work better than just the Tube Pipe Insulation is a product called Heat Tape and Pipe Heating Cables. Find the best solution for the situation and temperature and find other insulating materials for exposed water pipes or when water is not being used in the home… meaning water is not flowing in the pipes. Stop Freezing Pipes 5 – Be sure to insulate all water pipes that go through unheated garages, attics, and under crawlspaces. These areas are sometimes forgotten and may freeze or burst. It is best to insulate the complete area to keep the cold temperature from getting in these areas. When the heat tape or tube pipe insulation is added, the pipes are safe from freezing. Stop Freezing Pipes 6 – If you are not living in the home (vacant) and you are having a freezing pipes problem, another way is to attempt to DRAIN THE WATER OUT OF THE WATER PIPES. Run all water faucets and flush toilets. Open the drain faucet on the side of the home if applicable. Turn off the water main valve to your home. Attempt to flush the water out of all the water pipes in your unoccupied home. When this is done, leave the outside drain faucet cracked open a small amount to allow all water to flow out of the pipes. If there is no water in the pipes, then they cannot freeze. Keeping the complete home heater on at a reasonable temperature when doing this will also help. Do you have better methods for preventing water pipes from freezing? Please let us know by leaving your idea or method below. Next post: LG Washing Machine Displays Error Code PE – How To Fix And Clear Error?